Do you remember Microsoft Illumiroom? We wouldn't blame you if you didnt. Microsoft's research project some two years ago played with the idea of linking holograms to your TV, but it was rubbish, and it died gently, like old people. Or at least, we thought it did. Microsoft had a couple of rabbits at the ready last night. First out of the hat was a new holographic software platform, followed closely by Microsoft HoloLens - a slightly fat, bulky looking rabbit that sits on your head and runs the software. 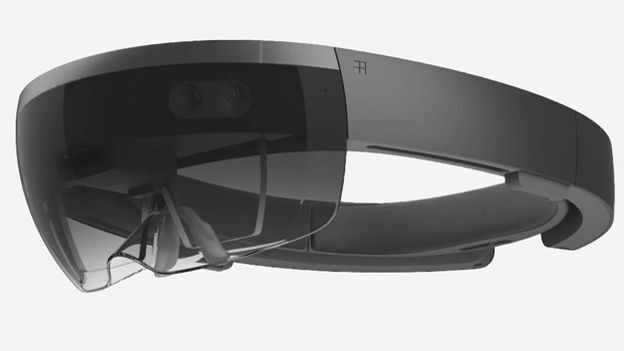 Unlike something like Oculus Rift, which presents you with a complete virtual world, HoloLens has clear lenses, and imposes your pre-built holographic structures and worlds on the environment around you. In short, it's an augmented reality device along the lines of something like Google Glass. It also features spacial sound, so you can hear holograms behind you as well as in front. All the while, it's taking in data from the surrounding area, and computing it through three processors, a CPU and a GPU but also a newly invented Holographic Processing Unit, which Microsoft claims is the first ever made. HoloLens is not only wireless, but doesn't require connection to another device, so you can walk around wherever you like. Augmented and virtual reality have been the flavour of the month for... well, a lot of months now. But Google Glass is dead, Oculus Rift and Sony Project Morpheus are still yet to reach consumers, and the best of the rest have failed to really capture the imagination. Microsoft's HoloLens is something a bit different, and it is certainly ticking the imagination checkbox. Microsoft is promising holographic Skype, Minecraft, and a NASA Mars exploration demo already, which sounds like a good start to us. Here's hoping for full holographic simulators soon after though. Something like Westworld, but without ultra-murdery Yul Brynner.